If you've ever played Scrabble, then you know how much fun it can be. Words with Friends is essentially the same thing as Scrabble, with a few slight differences. You play against an opponent you know, either connecting through Facebook or searching for their user name. You can also play against a random opponent. Because you don't have to play the whole game in one go like you would on traditional Scrabble, you can play one turn, then get back to work. You have about ten days to make your next move before the game is cancelled. The benefits of playing chess online are many. All you have to do sit and play each turn, allowing the other player to take as much time as he wants. Chess is great to play while you are in the office, because it requires that you use your brain, but it's still fun. 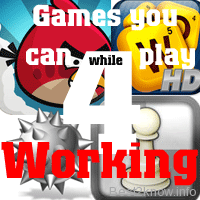 As such, you can play and all the while be preparing your brain to take on whatever task you took a break from. Minesweeper is a classic game that's been around forever, but it never seems to lose its charms for me. It's a very simple game that requires clicking on different squares, and if you click on the wrong square that may contain a mine, you have to start over. You determine which squares are mines and which aren't by the numbers that are revealed. Although it doesn’t require a large amount of skill, it doesn't require lots of time. It's the perfect thing to get your mind off your work, if only for a few minutes. This is a guest post contributed by Patricia Garza, who writes about gadget, technology, design, social media, e-learning related articles at online university rankings.If you would like to write for Best 2 Know, just Contact us and I will get back to you regarding it.